24 – 18°C, warm, humid sun building mist to rain. Thursday, another big day with DofE; this time, bronze Practice, and a year younger. Twice as many kids, less experience but first run, no fails. I spent the whole day on foot by myself. I can be more useful that way. Mostly in radio contact so I had no difficulty intercepting groups. I used the day to catch 5 groups at checkpoints, although I am normally allocated to 3. We issue checkpoints to all groups along with grid references. The girls plot their own routes freely as long as they make the checkpoints. I took a side route to the first. 3 groups pass Panner’s Pool and I relocate to meet them at the next one North. The big issue now is water. Many are only carrying 1 litre bottles, (despite instruction). Then a call comes in, a following group reports a broken leg! Emergency group: I go down on foot and Chris driver to the head of the valley. As I descend, I am able to ask questions about the condition of the group and their position. They obviously missed the turn and didn’t even see a large herd of black cattle. I had to ask about the direction of the sun, it’s obvious that they don’t have a sense of direction, nor can they use a compass. Their voices sounded calm. Chris was descending, but I really wanted to get their first. On arrival, the group were sitting at a derelict building and one girl had teary eyes. She had some tendon strain in her knees causing pain. No broken bones then. The wellbeing of the whole group is now my concern. They are all dehydrated. So, once more, I gave them my water (I carry 3 litres). Chris took the casualty’s rucksack and we headed up. Lost radio, after another relocation, and a few hours walking I took a road-crossing checkpoint. The group there were sheepish in manner; they had another problem. Each group carried a two way radio. Theirs was lost, dropped in the grassy moors. I took 4 of them and described how to form a search sweep. They seemed to know where it might be. We used another radio on the assumption that the lost one was switched on and would sound out when we transmitted. Amber spoke “walkie-talkie” into her handset and we swept south east. Then after only 40m, I could hear an echo, then a purple lanyard. There it was! Between rushes and the purple lanyard thread across the tops. We were all elated. That was a £150.00 radio recovered in perfect condition. How likely was that? These are a competent group, and their estimated search area was actually accurate. Back to the checkpoint and the group could continue on their route. Chris was hugely relieved too. Lost group 1: hours later, after mopping up over the moors and feeling rather grumpy with tiredness, I returned with the last group to camp. I moped about for a bit, feeling empty and maybe able to have supper first. I can keep going if I have food. Darkness came early this evening. 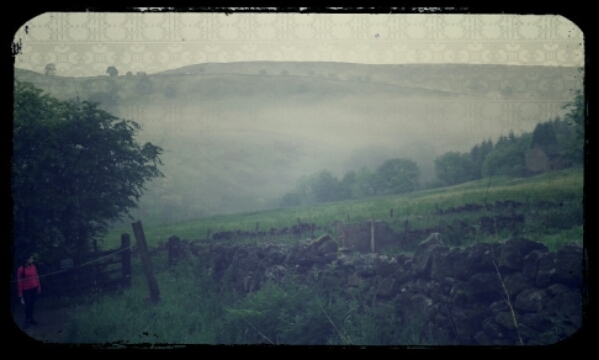 The thick cloud was turning the lower ground foggy and damp too. Rain was softly starting as forecast. It became apparent that Group 1 hadn’t returned from their route over to our West. Two mini-busses headed out to supplement Paul’s search. I hurried down to the edge of the woods, a sector not covered and added to the radio calls. Chris was repeating “group 1, answer your radio please”. The anxiety levels increased as he repeated more frequently. It occurred to me that as I head into the black forest, what if my head-torch battery fails? I’d be no use to anybody. Quickly back to camp and gather emergency provisions in my rucksack and put on proper boots. We could be out for another midnight recovery. My heart thumping, it struck me the contrast. From semi-dozing to adrenaline rush in five minutes. Into the woods and across the river I went, confident and alert to the slightest sound. Those haunting calls continued, I repeated some to spread the radio cover southwards. Circumstances were worse this time, the kids were younger, much less experienced and there could be a serious reason why they’re not answering. I was worried. I want them to have an unforgettable, life changing time, to begin love of the natural environment. I don’t want them to have a frightening experience. Emma’s voice broadcast at about 9, “group 1 are at camp”. That was quite an emotional moment. I bet it was for Chris too. It would be 5 minutes before I was ready to go back. Exhaustion set in, but hot food would soon be served in the staff house. I stood a chance of getting to bed by midnight. Well, there’s an improvement. Only a 12 hour day. I will get 6 hours sleep this time. This entry was posted in DofE, Hiking, Hill & Moorland and tagged Bronze award, DofE. Bookmark the permalink.